Radiation therapy, chemotherapy, non-chemotherapy agents, and surgery are the main cancer treatment modalities. Central Care Cancer Center has a team approach that promotes a closer relationship between the patients, the referring physician and the cancer specialists (Radiation Oncologist and Medical Oncologist). With this essential team communication, the patient can be assured of receiving the most comprehensive, customized treatment. Central Care Cancer Center works with a number of other healthcare professionals while you are undergoing your treatment to provide comprehensive support services. These specialists ensure that all of your physical, psychological, and financial needs are met during your treatment. Central Care Cancer Center strives to offer the most advanced treatment options available to help with your cancer journey. Our high standards for quality, efficiency, and compassionate care will help you navigate your journey through cancer treatment to survivorship. Often cancer treatment involves chemotherapy as part of the multi-modality approach of cancer care. Some tumors are exquisitely sensitive to specialized drugs, which are designed to combat the cancer at its site of origin and possibly its roots of spread. This powerful tool has to be given often in a very precise and timely manner in conjunction with other prescribed modalities. We aspire to encourage you through your journey, support you through your choices, celebrate your victories, and hope for a better tomorrow. We know you have a lot of questions and hopefully we can answer some of them for you here. Chemotherapy and You is written with you in mind - someone who is currently receiving or about to receive chemotherapy for cancer. Radiation Therapy Treatment incorporates high-energy radiation to target tumors and kill cancer cells. Our expert physicians combined with our access to state-of-the-art technology will provide you with the most advanced treatment options for the best possible outcomes. External radiation is delivered by a radiation therapist using a machine called a linear accelerator. The treatment beam is only on for a matter of seconds, although it is not measured by time. The linear accelerator runs on electricity, so when the machine is turned off there is no radiation in the treatment room. Internal radiation is called Brachytherapy (“break – ee – therapy”). Brachytherapy is delivered using a radiation source, such as Cesium or Iridium, which is implanted into the body. Brachytherapy can be delivered in a short amount of time or as a permanent implant which will decay over time, slowing releasing radiation as it decays similar to an extended-release medication. The new TrueBeam STx system from Varian Medical Systems is an advanced radiosurgery solution for treating cancer. A game-changing leap in innovation, it performs many different treatment techniques such as stereotactic body radiotherapy (SBRT) and stereotactic radiosurgery (SRS). With its power and flexibility, clinicians can now develop treatments that are best suited for patients’ individual circumstances. The TruBeamSTx is located at Heartland Cancer Center in Garden City, KS and at the Tammy Walker Cancer Center in Salina, KS. Central Care Cancer Center provides Radiation Therapy at the following locations: Emporia, Garden City, Great Bend, Newton, Salina and Bolivar, Mo. We know you have a lot of questions and hopefully we can answer some of them for you here. Radiation Treatment and You is written with you in mind - someone who is currently receiving or about to receive radiation therapy for cancer. Immunotherapy boosts the body’s immune system, and it typically results in fewer side effects that can be less severe than those associated with other forms of cancer treatment. However, not everyone experiences the same side effects, and, for some people, they may become more severe. Side effects of any cancer treatment can be physical as well as emotional, and some can be prevented while others may be managed. Knowing what to expect, and what to do if side effects do occur, will make your treatment experience more manageable. If you feel better, you are more likely to finish your treatment as planned by your treatment team. Ask your medical team about the side affects you can expect with immunotherapy, and when they are likely to occur. Surgery is the oldest form of treatment for cancer. It also has an important role in diagnosing and staging (finding the extent) of cancer. Today, more limited and less invasive operations are often done to remove tumors and to try to preserve as much normal function as possible. Surgery offers the greatest chance for cure for many types of cancer, especially those that have not yet spread to other parts of the body. Most people with cancer will have some type of surgery. Surgery can be performed in a cancer patient for many reasons. They include: Preventative, Diagnostic, Staging, Curative, Debulking, Palliative, Supportive, and Reconstructive. Surgery is only one part of a patient’s treatment plan. For example, a woman with breast cancer may be treated with surgery, radiation therapy and chemotherapy. Sometimes radiation therapy is used as adjuvant therapy to make your primary treatment more effective. For example, you can be treated with radiation therapy (the adjuvant treatment) before surgery (the primary treatment) to help shrink the cancer and allow less radical surgery than would otherwise be required, or you may be treated with radiation after surgery to destroy microscopic cells that may have been left behind. Teamwork and continuous communication between the patient, the referring physician, surgeon, radiation oncologist and medical oncologist will assure that the patient will receive the most comprehensive, customized treatment for their cancer. Central Care Cancer Center have joined forces with NCORP-KC (Community Oncology Research Program) to provide patients at participating locations with the latest in cancer research and care. 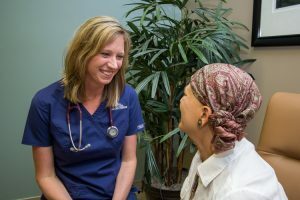 Eligible Central Care Cancer Center patients can enroll in selected NCORP-KC sponsored clinical trials, receive second opinions and consultations and participate in on-site outreach and education programs.